We foraged for healthy + gourmet fare at neighborhood shops. Here's what we found! For the past month, we've been on a very personal, very meaningful quest: A search for healthy, delicious gourmet fare we can eat at our desks or take home to cook ourselves. Many of you may know that a brand-new, full-service supermarket is coming our way when a block in the core of Rosslyn is redeveloped: 1401 Wilson Blvd./1400 Key Blvd. However, construction hasn't started yet, so where do we currently shop when we need to restock our snack drawer or pick up a few quick groceries for tonight's dinner? Here are our top picks for a foodie's shopping trip in Rosslyn. Rosslyn Coffee & Deli, 1101 Wilson Blvd. We love this shop for many reasons: It's a small, family-run business that has been in Rosslyn since the late '90s. They have terrific, made-to-order deli sandwiches, coffee drinks and frozen yogurt, but they also have a great little grocery section. The owners like to eat healthy themselves, so they've stocked their market with a plethora of good-for-you snacks for those who want to nosh responsibly. 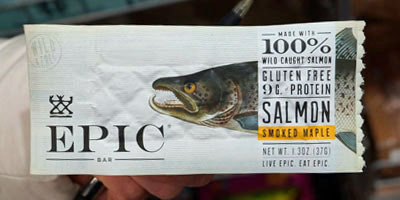 Don't laugh, seafood lovers: this EPIC, gluten-free smoked-maple salmon bar is awesome—and the company that makes it says it's actually the first seafood-based protein bar ever! Rosslyn Coffee & Deli stocks this as well as other nutritious snacks from EPIC, including chicken, lamb, beef and bison bars. They're great for you and delicious. Trust us. Rosslyn Coffee & Deli also has a variety of snacks from Steve's PaleoGoods, a company whose products are part of the Paleo diet and gluten-free. 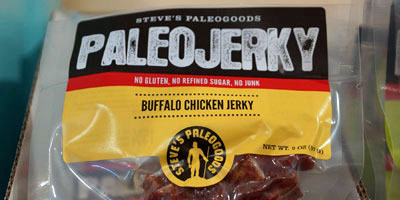 Our favorite is the buffalo chicken jerky, but there are lots of other great Paleo choices, too, including grass-fed beef jerky, Kaleocrunch (grainless granola with kale) and several varieties of dried fruits made without added sugars. 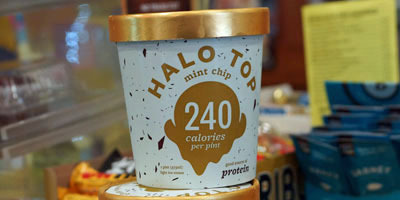 Before you get the mistaken impression that all we eat here at the Rosslyn BID is health food, let us reveal to you this heavenly Halo Top mint chip ice cream. It's so rich and delicious, and Rosslyn Coffee & Deli has a great selection of flavors. Technically it is healthy ice cream—made with organic stevia instead of sugar—but we swear you won't know the difference. We were surprised by how many gourmet products the Rosslyn Safeway had. Clearly they're trying to appeal to residents seeking more than just the basics. You just have to know where to look! They also have a great selection of interesting grains we didn't expect to find there, such as farro, quinoa, bulgur wheat and hemp hearts. 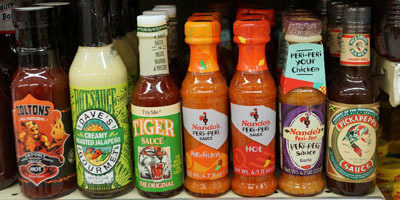 We're an office of spicy eaters, so Safeway's vast selection of hot sauces definitely pleased us. Since we now enjoy dining at the Rosslyn Nando's PERi PERi, which opened in March, it was especially gratifying to see that Safeway has three varieties of their hot sauce, including the original—and wonderful—Nando's PERi PERi sauce. Now, we can all grill our own mouthwatering chicken at home. Why is this tiny jar of honey so expensive? It's $23.49! 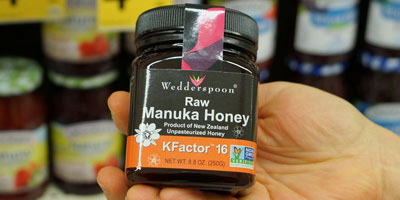 Turns out it's Manuka honey, a type of raw honey produced in New Zealand that's known for its healing properties. We can consume this superfood, which is more nutritious than normal flower honeys, or apply it to scrapes and cuts. Trials have shown that it does help heal skin wounds. Bet you never thought you'd find this in our subterranean supermarket! Our neighborhood Target is a convenient source of so many useful products, from cell phone accessories to athletic gear to groceries. We love some of their Archer Farms prepared meats for a quick weeknight dinner, such as their bacon-wrapped sirloin medallions or their parmesan-breaded chicken cutlets. We also came across a couple of our favorite snacks, too! 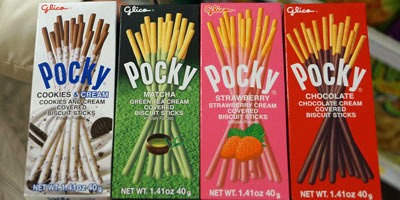 A wonderful cookie-like treat originally from Japan, Pocky comes in chocolate, strawberry and other great flavors. It's not always easy to come by—we often snag ours at Eden Center in the NoVa 'burbs—so we were pleasantly surprised to find a large Pocky display at the Rosslyn Target with some unconventional flavors, such as Cookies & Cream and Matcha. At just $1.79 per box, it's a great price! Okay, so this product isn't hard to find, but it's a favorite of ours so we just had to include it. 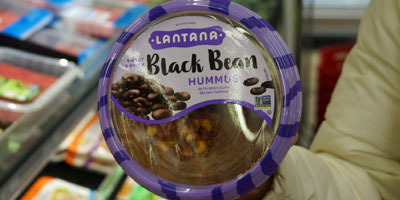 We think Lantana's Black Bean Hummus is the perfect blend of sweet and spicy flavors. Keep it in the office fridge and try it as your afternoon snack with pita chips, carrots and pepper strips: It's seriously addictive! This is usually one of the more expensive products of its type in the grocery store, but Target sells it for $1 less than most supermarkets. Just sayin'. MOM's Organic Market, 1901 N. Veitch St. Yes, we know this is not in Rosslyn. But we love it anyway. First, it's a very quick bike ride/drive/bus ride up Lee Highway, so it might as well be in Rosslyn. Second, it's great. Third, if you drive there they have a convenient parking garage so you can be in and out very easily. Fourth, their Naked Lunch café is terrific. MOM's is also rarely busy (unfortunately!) so it's not the semi-stressful experience you might encounter at our nearby Whole Foods or Trader Joe's. Check out some of their great offerings below. MOM's has so many varieties of eggs it's amazing. 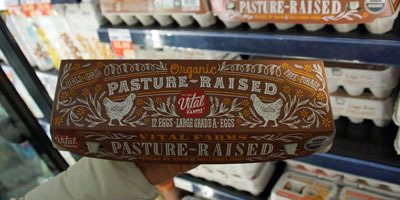 But these eggs—Vital Farms Organic, Pasture-Raised eggs—are the best. The hens who lay them roam freely and eat what they want, in addition to supplemental food provided by the farm. And it shows: These eggs are delicious. They may be a bit more expensive, but they're worth it, even if only for an occasional treat. Most grocery stores have some gluten-free products, which is helpful for those with celiac disease or gluten allergies, but often it's hit or miss. If this is your situation, MOM's is the place for you. They have a huge section of gluten-free EVERYTHING in addition to random gluten-free products throughout the store. 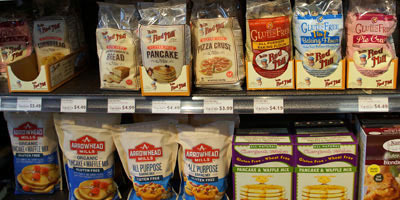 Check out this small sampling, pictured here: gluten-free pancake mix, baking mix, pizza crust and more. 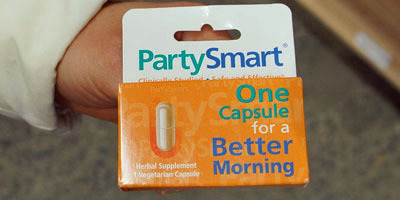 Just when you thought you'd seen everything: MOM's even sells an herbal supplement called PartySmart that you can take while consuming alcohol. It's said to help neutralize a certain chemical produced by the liver when drinking alcohol—a chemical that can make you feel sick the next morning. We've never tested these to see if they work, but they're certainly worth trying the next time you have a little too much fun doing shotskis at Quinn's or wine slushies at Continental Beer Garden! FRESHFARM Rosslyn Farmers Market, 1800 N. Lynn St. 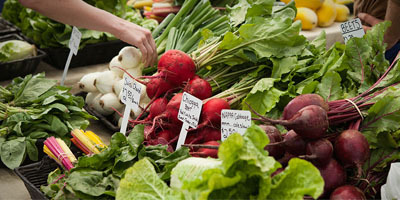 The FRESHFARM Rosslyn Farmers Market, which is open every Wednesday afternoon 2:30-6:30 p.m. until October 31, is a great spot to shop for fresh fruits and vegetables, meats, bread, pastries and more in a pleasant outdoor setting. All the products at the market come from local vendors or nearby small farms, so you can feel good about supporting these often family-run enterprises. Plus, every few weeks we have fun activities planned at the market, such as tastings, fitness classes and more. Did we miss your favorite neighborhood shop or essential food item? Email us and let us know. We'll add it to our list! Photo at top: The shelves at MOM's Organic Market, a great shopping option that's close to Rosslyn.